This is not really my kind of story, usually. I am not a huge Broadway person, haven't been to a play since I was a little thing. But for some strange reason, I find myself stepping out of my comfort zone more and more lately and this one was a bigger step than usual. Thankfully, it paid off. After Finley's dad, a huge movie star, passes away and she is jerked out of the home she lives in with her mother and brother due to abuse, Finley ends up living with her Godparents. She has been there for several years, but she still feels like she doesn't quite belong. She is always doing everything to show her appreciation to her family, and prove to them that she is worth it. Oliver, their son, is her best friend in the world, and the only one besides her brother who makes her feel safe. Oliver has loved Finley from the minute she moved in. He wants to help Finley see how wonderful she is, and to help her overcome her past and her fear. So he hides his feelings for her down deep, to protect her. He is also trying to figure out what HE wants in life, and if the expectations from his family override his own dreams. When two young movie stars move in next door, everything simple gets thrown out the window. New relationships form, and Finley and Oliver's relationship changes into something new. Finley is becoming more assertive every day, starting to realize her worth. And Oliver is happy with Emma, more than he ever thought he could be. He is starting to realize that his desires matter. So why do they both sometimes wish for something different? I really enjoyed this book. I actually really liked the little tid-bits of acting and plays thrown into the mix. There are all the right kinds of emotions, some laughter and definitely some tears. The characters are very well-rounded and relateable, and easy to care fore. The story is a little on the slower side as far as pacing, but that never made my interest wane. I was invested until the end, and I really enjoyed the ending a lot. 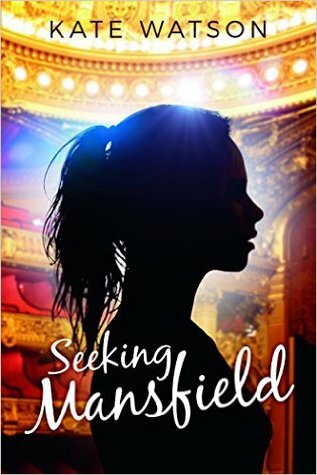 All in all, Seeking Mansfield is a great romance. I love the themes of friendship in the story. I might not be a Broadway Baby, but this book definitely made me curious to know what else might be out there in this realm. And the cover is really pretty, too! Definitely have no problem recommending this one.